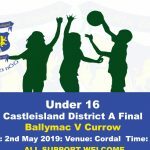 On Thursday next the 2nd May our U16 team play Currow in the Castleisland District A Final. Both Ballymac Team’s made the trip to Killarney last Thursday 25th April for Rd 3 Div 1 County League and credit to both set’s of players who put in two impressive performance. 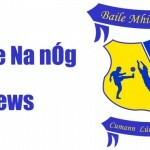 Our Gold Team played Kenmare at home on Wednesday,April 17th. the score at half time was 2-7 to 3 points. Our Blue team played host to Firies last night Wednesday 24th April and won the game 4-12 to 4-08. The Lotto draw this week took place in The Half Way Bar tonight 22/4/19. The numbers drawn were: 1,2,20 and 21.